Henri Pittier National Park & La Cíenaga. Your 3 1/2hr journey from Caracas takes you through the “garden city” of Maracay to a fork in the road – left to Ocumare de La Costa and right to the famous beach town of Choroní. Either direction you drive the winding road high into the cloudy rainforest of Henri Pittier for the best part of an hour before your descent, in this case toward the quaint coastal town of El Playon beyond Ocumare. The air is fresh and filled with a cacophony of music from the birds of the forest! Occasionally you may stop to take in the breathtaking views or join others in observing howler monkeys in the trees alongside the road. Finally the first signs of village life appear with an empanada stand sitting at the side of the road then more signs of life as locals bathe and play in the rocky stream to your left that winds towards the villages below. Traveling through small villages the road comes to an end as you reach La Boca, a quaint fishing village where the local fishermen mull around, selling their catch of the day or fixing their fishing nets for the next days’ excursion. Here in La Boca you commandeer one of the locals and his fishing boat and head towards the mouth of La Cienaga, a picturesque lagoon on the edge of the national park and merely a 15-20 minute boat ride from the village. If you are lucky you may run into some dolphins doing their own fishing along the way and swimming alongside your launch. The lagoon opens its doors and welcomes you in, turquoise waters and a handful of small cabins dotted along its perimeters on two sides greet you. On three sides are the mountains of Henri Pittier dotted with vegetation and xerophytic forests. Here is home for your next few days in your own piece of paradise your very own nature lodge with just three bedrooms for its guests (Coral Lagoon Lodge). Sip cocktails or read a book on the edge of the lagoon in your hammock and marvel at your surroundings during the day and at the starlit sky at night. 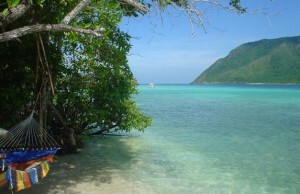 Then spend your days snorkeling, kayaking, diving, trekking or simply relaxing in that hammock made for two. The lodge is open year-round. Departures are flexible based upon availability of course. The best time to go is during the week or beginning either Friday or Sunday. Weekends are often full of local, national tourists in the lagoon and for the best experience we recommend trying to avoid that time frame (and national holidays too). The price for Coral Lagoon Lodge is all inclusive - it includes all drinks (alcoholic and non-alcoholic), all meals, lodging and use of kayaks / snorkel gear. Diving also available upon request for 3 or more persons. IMPORTANT - since the lodge is remote we have logistical challenges bringing in staff for cooking, security etc. so therefore can only operate outside of the weekends if we have four or more in the group. We have 3 bedrooms and can accommodate up to 8 people. Depending upon arrival time in the area – you could stay the first or last nights at De La Costa Ecolodge on the mainland (our sister lodge in El Playon) at a competitive price, enjoy breakfast there and then head to the lodge in La Cienaga. Prices at the lodge vary depending upon time of year, time of week and size of groups so please contact us for more information. Prices in the region of $45-50pp per day (specific quotations available upon request) – excludes gratuities and transport to and from Caracas or elsewhere. Suggested – 3 to 5 nights. Avoid public holidays and weekends if possible. Depends how long you want to drift in your kayak or swing in your hammock!